Last night I went along to The Stable, John Bright Street, in Birmingham as I’d been invited to try their spring/summer menu. The Stable, the pizza, pie and cider group, now has 17 locations across the UK and the Birmingham one is in a great location in the heart of the city. There’s plenty of seating (bench style so you may have to share your table), both inside and out and on a summer’s evening there’s a lovely relaxed vibe. 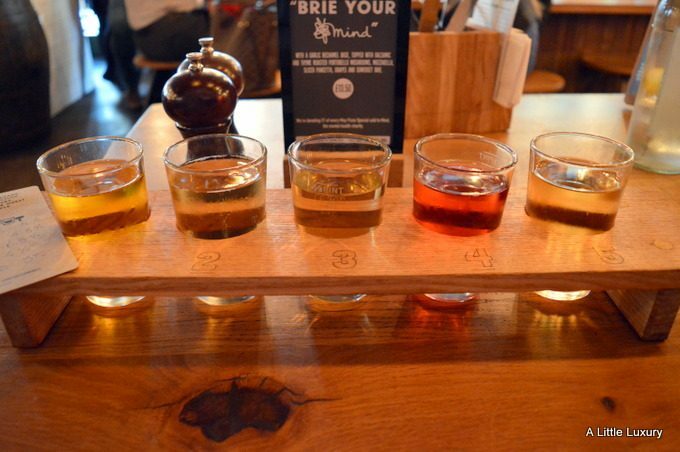 We started out with a cider tasting board with 5 ciders. The Birmingham cider master came over to talk us through the selections and it was great to learn more about what we were tasting from someone who was clearly an expert and an enthusiast. I found the Lilley’s Mango and the Green Valley Strawby a bit sweet and fruity for my taste. My preference was for the drier, still Andsome Bay, followed by the Sheppy’s. Thankfully, my drinking (and eating) companion had a sweeter tooth than me, so it all worked well. 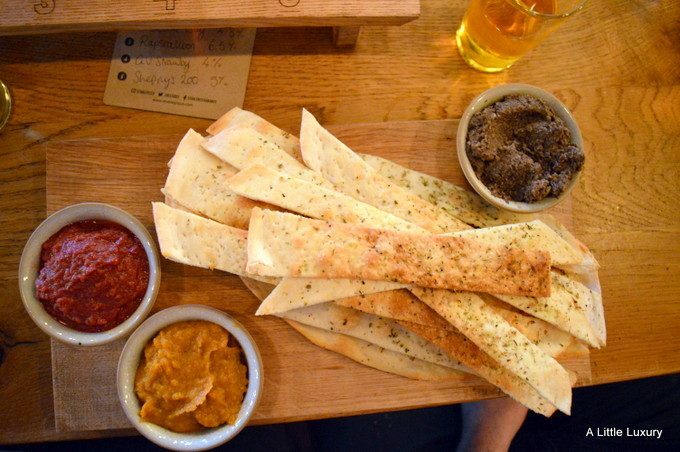 We took the edge off our hunger with some Stix & Dips. The bread was very yummy and moreish. I was very taken with the butternut blitz dip and made short work of that – it was smoothy and had a lovely squashy flavour. My friend seemed to prefer the mushroom & olive tapenade, but the beetroot hummus was tasty too. All in all a big hit and I’ll certainly be ordering Stix & Dips again. For starters we had The Dorset Spread and Sladesdown Duck. The Dorset Spread wasn’t our favourite dish of the night as the pickled cucumber seemed just too harsh and vinegary. I really loved the Sladesdown Duck and regretted not ordering the main course version instead of a pizza because it was so very good. The blood orange and the pomegranate were the perfect combination with the duck and this dish was the star of the evening’s food for me. My companion couldn’t resist ordering the Smethwick Scorcher for a main course. I think the appeal was partly in the name (after a local suburb), but also partly in the maximum of chilli rating of 3. I found the chilli a bit overpowering, but I have milder tastes so I’m not a good judge of very spicy food, and I opted for the Bourneville Bantam (named for another local suburb). We loved the super thin and crispy bases and there was plenty of topping. That’s exactly how I like my pizza, so this was a treat for me. 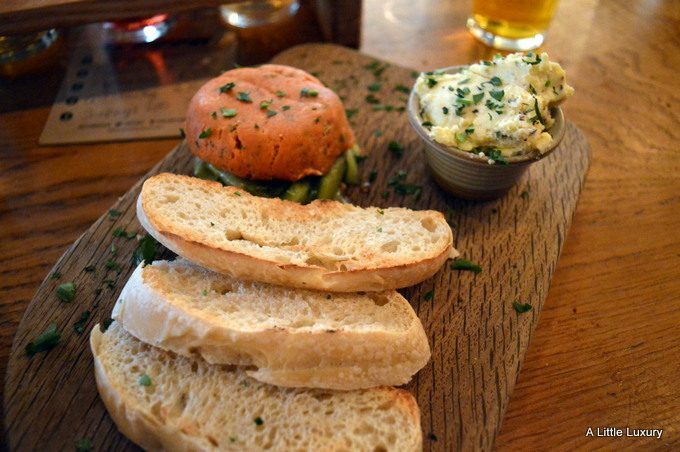 The Stable is a great place to go for meal with friends and perfect for a summer’s evening when you can sit outside – it’s very relaxed. I like the west country slant to the ingredients and it really was an eyeopener when it came to cider drinking. 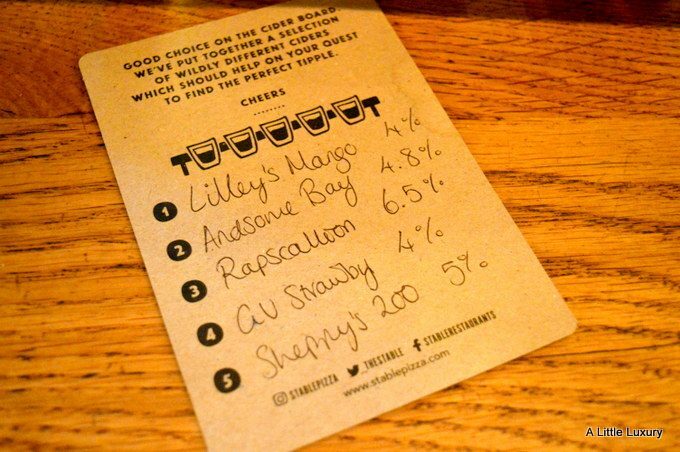 Birmingham isn’t known for the range of its ciders and in the past I’ve had to go out into rural Worcestershire to taste some good ones, so a venue serving and celebrating quality ciders is a great addition to the scene. 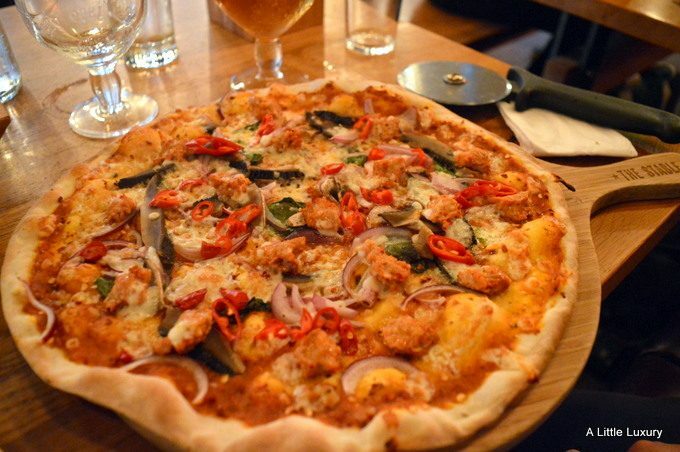 Its always nice to discover new places to eat at .All the food looks great here and I do like the sound of the chilli pizza that’s right up my street. Awesome. Capital A. Two of my favourite things cider and pizza at the same sitting. Birmingham has so gone up in my estimation. I’m feeling hungry just looking at the pics. Should I find myself in the area I’ll be sure to call in to The Stable. I’m really intrigued by the range of ciders that you got to try. I think that would be fun to try with friends. I’m loving the sound of that duck salad. It’s a favourite dish of mine to order in restaurants. I haven’t heard of this chain but their range sounds great, I would definitely have tried the cider tasting board too! This sounds nice, I’ve never heard of The Stable before but the food sounds and looks lovely. I do however get really put off by bench style seating, I hate sharing my table with other people argh!